This Logic Pro 8.0.2 update addresses specific customer and compatibility issues of Logic Pro 8.0 and WaveBurner 1.5. This update is recommended for all Logic Studio users. For more information about this release, please go to Logic 8.0.2 Details. If you are using Logic Node you will need to update your Logic Node application on connected computers as well. After running this updater you will find an updated Logic Node installer called Logic Node 8.0.2.dmg in your Utilities folder. This Logic Pro 8.0.1 update addresses specific customer issues and compatibility issues of Logic Pro 8.0 and WaveBurner 1.5. If you are using Logic Node you will need to update your Logic Node application on connected computers as well. After running this updater you will find an updated Logic Node installer called Logic Node 8.0.1.dmg in your Utilities folder. The Arrange window in Logic Pro 8 consolidates production activities in a single, elegantly-designed workspace. You can record multiple takes; cut, move or stretch audio with sample accuracy; browse channel strip settings; audition Apple Loops; and drop chords onto your lead sheet—all from one central space, without managing multiple windows. Production-ready templates, a streamlined track setup window and dynamic channel strip creation get you up and running fast. Improved ReWire support provides easy integration with other music applications. Region-based take management speeds up multitake recording, editing and processing. An expandable take folder makes it simple to recall overdubs, and entire take folders can be moved and edited like regions. With breakthrough Quick Swipe comping, you can simply swipe over the best portions of each take to create a seamless comp, complete with transition-smoothing crossfades. Work faster and with greater precision using powerful new features like snap-to-transient selection, graphical time stretching and sample-accurate editing in the Arrange window. Logic Pro 8 allows for end-to-end surround production with multichannel tracks and busses. True Surround and multi-mono support lets you use any surround, stereo or mono plug-ins within any surround project. Save your key commands, channel strip settings and plug-in settings to your .Mac account for easy backup, sharing and portability. 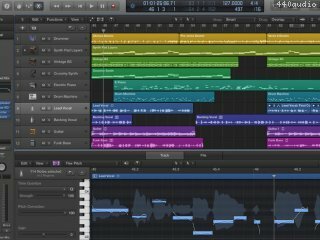 Logic Pro 7.2.3 addresses performance issues when Logic Pro 7 is used on Mac Pro and G5 Quad computers. Logic Pro 7.2.3 is recommended for all Mac Pro and G5 Quad users. An existing Logic Pro 7.2.1 or Logic Pro 7.2.2 installation is required for this update. Logic Pro 7.2.2 is recommended for all Mac Pro users. An existing Logic Pro 7.2.1 installation is required for this update. Logic Pro 7.2 is a Universal application, which means it's designed to run natively on both Intel- and PowerPC-based Macs. Stay compatible as Apple continues to deliver new Intel-based systems. Logic Pro 7.2 offers integrated support for Ensemble, the new FireWire audio interface solution from Apogee Electronics, providing superb Apogee sound quality and mix-and-match expandability at breakthrough prices. Multiple parameters — including headphone level, metering source, output levels, and even microphone input gain — can be manipulated from a control panel within Logic Pro. Purchase a special Audio Unit version of the legendary Pitch 'n Time plug-in from Serato and you'll have access to its extraordinary algorithms directly from Logic Pro's Time and Pitch Machine or from the audio time stretch options in Logic's Arrange window. Available exclusively within Logic Pro 7.2, this option renders rich and natural-sounding results, even at extreme settings. Logic Pro 7.2 provides support for stereo Rewire objects — and now clearly labels the incoming Rewire streams to reflect the source application. In addition, you can create Rewire objects directly from the Create Multiple option in the Arrange window. Users of multi-channel Audio Unit instrument applications — such as the popular BFD — will appreciate that Logic Pro now has increased output capacity of to 32 mono-channels. Logic Pro 7.2 allows you to play back AAC and Apple Lossless files directly — with no need for conversion. This feature ensures session compatibility with Garageband 3 and offers great sonic quality with the convenience of smaller file sizes. Ducker offers automated voiceover volume reduction functionality, known as "ducking," on Output or Bus tracks. Speech Enhancer provides a simple option for cleaning up and enhancing recordings made with the built-in microphones. Logic Pro 7.2 includes the same Jingles and Sound Effects library that ship with iLife '06. A dedicated Effects button in the Loop Browser makes it easy to view and filter this new collection of sounds. The library includes more than 200 sound effects and 100 jingles. 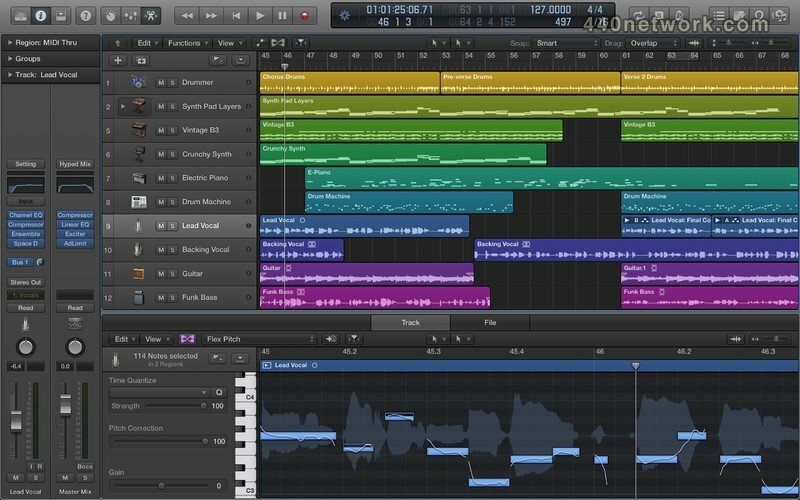 The Logic Pro 7.1.1 Update addresses isolated reliability issues. It also improves compatibility with Mac OS X version 10.4 (Tiger). For more information on this update, see here . Take advantage of full plug-in delay compensation which now corrects for latency produced on bus, auxiliary, and output channels in addition to every other path in the native audio mixer. You'll especially appreciate this enhancement if you own third party DSP cards like those developed by Universal Audio and TC Electronics. Add beef and character to your bass or other instruments with a new Bass Amp plug-in which replicates the sound of the industry's sweetest bass amplifiers and direct boxes. Tighten up any performance using the Enhanced Timing plug-in or be inspired by the massive atmospheric synth textures produced by two new Hybrid Synth instruments. Enable the new "Follow Tempo" Region parameter for any audio recorded into your song, and Logic will time and pitch shift the file when you change the song's tempo or key. Apple Loops playback correctly in sessions with sample rates other than 44.1 kHz. Recycle files consistently import as expected. All Acid Loops transpose in Loop Browser as expected. TDM tracks are successfully bounced even when native bounce is set to "offline". Accents in sequencer now perform consistently. There are no longer graphic glitches when copying step sequences. The Import of Ultrabeat factory drum kits now works consistently. Drum voices begin playback more quickly when auditioning while importing a Ultrabeat kit. Automating more than one Ultrabeat drum voice now works as expected. Loading a Channels Strip Setting will no longer switches the "Transpose" instrument parameter on. The Guitar Amp mic position setting is not lost when loading a Channel Strip Setting from Logic Express into Logic Pro. MIDI device names from Audio MIDI Setup or Logic Setup Assistant show up properly in default song. Multi-Instrument Bank Messages won't change when importing a Song from Logic Pro 6.4.3. "Goto Position" window does not inadvertently switch to current SPL position when opened. "Send to MIDI > Maximum Volume" sends to all channels, not just channel 1. Guitar Tablature preferences and tuning definitions can be entered via menu options again. Screen updates now occur more consistently so there are less graphic glitches. Audio Suite plug-ins process correctly regardless of whether there are open floating windows. Both sides of a split stereo file are converted when performing a sample rate conversion within the Sample Editor. The Copy/Convert function behaves properly. The names of Pitch Correction plug-in parameters are displayed correctly. Logic Control no longer generates notes in Learn mode. All plug-in parameter names are displayed correctly. Yamaha mixers no longer install multiple times in the Setup window. Assignments are now possible in the Controls View. Distributed Audio Processing : Run tons of plug-ins using additional G5 processor power. Apple Loops : Produce sound beds instantly from a comprehensive audio library. Sculpture : Synthesize anything naturally via component modeling. Ultrabeat : Bang out endless permutations on a modern drum machine. EFM1 : From dreamy landscapes to punchy belltones with FM style. Guitar Amp Pro : Dial in sweet guitar tones from arena to funk, live or in studio. Linear Phase EQ : Manipulate EQ curves without corrupting phase. Match EQ : Match acoustically two signals to transfer frequency spectrum. Pitch Correction : Correct improper intonation on vocals or force to monotone. Ringshifter : Add metallic sheen to any loop or sample for haunting effects. Recall Channel Strips : Save all channel settings and parameters for future projects. Global Tracks : Control tempo, signature and more, all graphically. Shuffle Editing in Arrange : Restrain movement to prevent regions from overlapping. Auto Crossfades in Arrange : Apply crossfades automatically to overlapping regions. Software Instrument Layering : Play MIDI regions through multiple software instruments. EX24 Editing Improvements : Drag and drop audio and edit zones graphically.